I’m not complaining, mind – I’m a closet royalist and can’t wait to flick on the TV on the 29th. 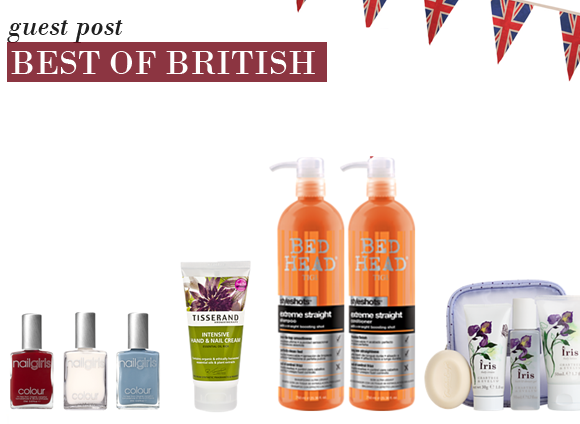 To get us all in the mood, I have picked my favourite British beauty brands. Rule Britannia! This hip nail salon may have a chic Manhattan feel, but the sisters behind it are British through and through. After launching their slick, yet affordable nail spa in London’s Islington, Jo and Lynda-Louise Burrell set about creating “a colour collection that was ahead of its game in the fashion stakes.” The polishes are just that, with a new catwalk-inspired range launched at the beginning of each season. I’m a big, big fan. Try: Nailgirls Spring Seasons 2011 Colours, £9.95 each. I’ve blogged about Tisserand before, as I am one of its most enthusiastic customers. The company was founded by Robert Tisserand in 1974, when he was just 17. Robert used to bottle the oils in his South London bedroom, handwrite the labels, and then head to his local Post Office to dispatch to customers. Since then, it’s grown into a huge multinational brand, but it doesn’t make the products (made from delicious blends of essential oils) any less appealing. Try: Tisserand Intensive Hand & Nail Cream, £6.75. TIGI Bed Head is a British success story… It was first produced in 2003 by iconic hairdressing brand Toni & Guy – and it has gone from strength to strength. It stands out on the shelf with ultra-bright packaging and quirky brand names (from ‘Dumb Blonde’ to ‘Small Talk’) – but it’s the effective, luxurious formulations that I’ve really fallen for. Their Shampoos and Conditioners are hard to beat. Try: TIGI Bed Head Styleshots Extreme Straight Shampoo, £10.50, and Conditioner, £12.50. Beauty doesn’t get more British than Crabtree & Evelyn. With packaging and formulations inspired by the nation’s gardens and countryside (and lets be honest, we have a lot to boast about on that front), it’s a brand that appeals to generations old and new. Recently launched to celebrate the brand’s 40th birthday, the new collection of home fragrances (Lily, Rose, Lavender, and Iris) promise to bring summer into your home. Try: Crabtree & Evelyn Iris Traveller, £9.95. Leaves hair fresh, clean and definaely helps keeps it straight. This entry was posted on Monday, April 18th, 2011 at 8:58 am and is filed under Guest bloggers, Haircare, Make-up, Skincare. You can follow any responses to this entry through the RSS 2.0 feed. You can skip to the end and leave a response. Pinging is currently not allowed.